In Part One of this series, I promised you’d hear from more authors about the meaning they find in the books they write. In her work as a police officer, Robin Burcell, is a close witness to the craziness in our world. She has worked a number of assignments for her department, including: Patrol, Crimes Against Persons, Child Abuse, and Property Crimes. She is also the department's forensic artist, trained by the FBI at Quantico, Virginia, and has done drawings for a number of agencies, including the FBI. Currently she works patrol and is a member of the Hostage Negotiation Team. Her first book was a romance about a police officer. Now she writes a police procedural series featuring homicide detective Kate Gillespie in San Francisco, including Every Move She Makes, Fatal Truth, Deadly Legacy, and Cold Case. “I used to write romance, but started writing police procedural mysteries, because after having twins, romance wasn't high on my list of priorities. What I found, however, was that writing the police procedural helped me cope with the day-to-day stress of working as a police officer – definitely an interesting side effect. “I find writing mysteries to be cathartic. Pick up any newspaper. The latest murder makes the headlines. People are constantly barraged with real life stories that don't have happy endings. My protagonist, Kate Gillespie, a cop who plays by the rules, recognizes this. She is faced with overwhelming odds and enemies that are ruthless and will do anything to win. Denise Swanson’s protagonist, Skye Denison, mirrors the author’s career as a school psychologist working in a small Midwestern town. Some years ago, Denise realized that a school psychologist, with access to many secrets, would be the perfect amateur sleuth for a mystery series. Murder of a Small-Town Honey introduced the award-winning Scumble River Mystery series. The sixth in the Series, Murder of a Pink Elephant, was released this summer . “I had three reasons for wanting to use a school psychologist as a sleuth. One, after eighteen years of experience, I knew I could get it right. I was tired of seeing school psychologists portrayed, when they were even mentioned, totally wrong. My second reason was to help the general public understand what a school psychologist does. Actually, just to let people know that the profession exists. Last, I wanted to explain special education and describe the children it serves. G. H. Ephron is actually a two-person team, practicing forensic neuropsychologist Donald Davidoff, Ph.D., and writer Hallie Ephron. Their series features forensic psychologist, Dr. Peter Zak. Like their fictional protagonist Dr. Zak, Don is often brought in to provide expert testimony in criminal trials. Hallie went through several careers before writing fiction. She’s been a teacher, a marketing copywriter, a multimedia producer, and has a Ph.D. in educational measurement and testing. In addition to mystery novels she has published short stories and magazine feature articles. Hallie explains their partnership this way. “It works because we have absolutely no overlapping talent. He’s great on plot, character, and of course psychology. I write. When we started working together frankly I was afraid Don was going to want to write. Turns out he was afraid I was going to make him write. “We use the mysteries to teach about psychology – hopefully in an entertaining and not preachy way. In Amnesia, we're talking about memory. Memory loss, repressed memory – and people who want to forget but can’t. In Addiction, it’s psychological craving, and whether addiction to a substance can make you do something you wouldn't ordinarily do, such as kill someone. We’re also exploring how hospitals have become addicted, in a way, to the research monies from pharmaceutical companies. in Delusion it’s paranoia – can it be catching, and is it an illness or a healthy response to a world gone mad? Obsessed features Dr. Zak walking the fine line between concern and stalking. With a background in television news and public relations, Libby Fischer Hellmann has been writing all her life. She turned to fiction six years ago. Libby’s series (An Eye for Murder, A Picture of Guilt, An Image of Death) features videographer and single mom, Ellie Forman. When she’s not writing, Libby writes and produces videos. She also coaches individuals and groups in presentation skills, speech delivery, and media interviews. Born and raised in Washington, D.C., she and her family have been living in the Chicago area over 20 years. “When I finally did find ‘Ellie.’ I wanted her to be somewhat observant, but not so much that it would limit her activities as an amateur sleuth. I also thought it might be a nice way to introduce non-Jewish readers to a few customs and the thinking behind them. In the same way, readers who are Jewish might recognize themselves in Ellie. Hence, Ellie considers herself a Conservative Jew, does go to ‘shul’ (albeit for the most part reluctantly), keeps what she calls ‘kosher lite,’ and observes holidays with her family. Rochelle Krich has written eleven novels, beginning in 1990 with Where’s Mommy Now? Her new series, including Dream House and Blues in the Night, features true crime writer Molly Blume, an Orthodox Jew. The daughter of Holocaust survivors, Rochelle was born in Germany and lived in New Jersey and in New York before moving with her family to Los Angeles in 1960. She was teaching English and raising six children when she began her writing career. “The juggling was difficult,” she admits, “and I’ve made my share of mistakes. At one point the hems of my daughters’ uniform skirts were being held up by over a dozen safety pins, and I served way too much macaroni and cheese! But somehow we all managed, and my husband and children are wonderfully supportive. Which doesn't mean that they're never cranky.” Rochelle weaves contemporary social problems and her Orthodox Judaism into her works. “As a mystery writer, my goal is to tell a great story – one with an intriguing, suspenseful plot, well-developed, layered characters, and credible motivations. At the same time, I write about social issues because I find them compelling. And writing about them gives me the opportunity to explore the issues and my views about them. And learn. I welcome the research that goes into the writing and often find that my preconceived notions are totally off the mark. I wrote about teen violence because like everyone else, I’m frightened and saddened by the horrific killings at Columbine and Paduka. I wrote about domestic violence because a young mother in our community was brutally murdered by her husband. This column first appeared in Mystery*File 45, August 2004. 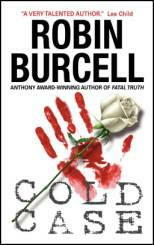 Updates: Robin Burcell’s most recent mystery novel has been Cold Case, which appeared in January, 2004. 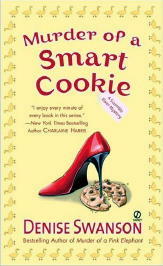 Denise Swanson’s latest Scumble River mystery, Murder of a Smart Cookie, came out in July, 2005. 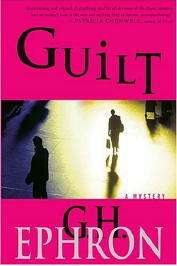 The fifth Peter Zak mystery, Guilt, by G. H. Ephron, was published in hardcover, March 2005. 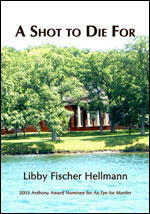 Libby Fischer Hellmann’s fourth Ellie Foreman novel, A Shot to Die For, came out in September, 2005. 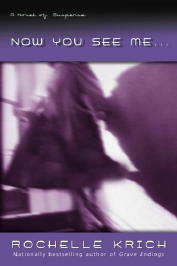 The fourth Molly Blume novel, Now You See Me..., by Rochelle Krich, was an October, 2005, trade paperback release. Copyright © 2004 by Steve Lewis. All rights reserved to contributors. Return to the Main Page.